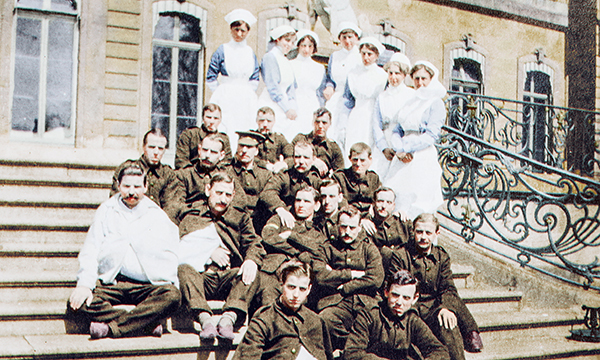 First world war: can you help solve the mystery of the nurses of Wrest Park? Photographs of nurses in the first world war have been colourised in a bid to help discover the subjects' identities. The pictures were taken between 1914-16 at Wrest Park in Bedfordshire, when the country house was used as a military hospital. As casualties from the Western Front mounted, the house was turned into a three-ward auxiliary hospital overseen by Nan Herbert, sister of the owner Auberon Herbert, Baron Lucas. Staff records are scant, so researchers from English Heritage are hoping people will recognise relatives among the collection. Around 24 nurses at any one time cared for a total of 1,600 soldiers in the two years before fire destroyed the hospital on 14 September 1916. Most of what is known about life at Wrest Park comes from Nan's diary, which she wrote while she was matron there. In one entry, she writes: ‘Summers, the little cockney from the London Hospital unearthed the old costume box, and from that time, evening concerts were in steady demand, especially as extra beer was served. ‘We nurses sat on the stairs, the convalescents in the hall singing, reciting and dancing’. Despite the lack of records, researchers have established details of several nurses, including nurse probationer Nathalie Ridley, the daughter of Russian ambassador Count Alexander Benckendorff. English Heritage's lead properties historian Andrew Hann said: ‘These women were the backbone of the hospital, and indeed of the war effort, providing much needed treatment to the wounded, but also acting as a comfort to those soldiers traumatised by the horrors of war. The photographs will be on display at Wrest Park until the end of the month.